One of six professional fights for Friday's SFC: 300 at the River City Casino, Yohance Flager (10-7) expects to end his professional MMA career on his terms, going out in style as the winner. 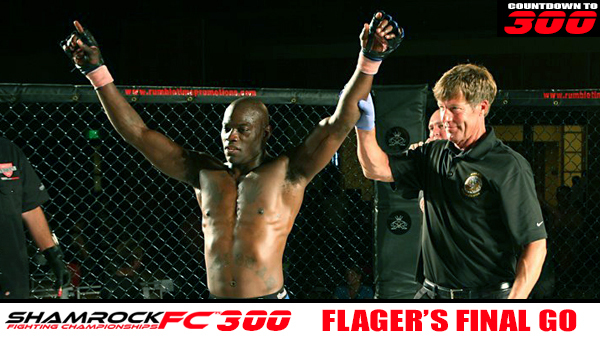 His opponent, Scott Ettling (4-2) will attempt to send Flager into retirement knowing his best days were behind him. Flager is a long-time fighter from the St. Louis area. He's been in the ring or cage 35 times between his amateur and professional career. On Friday, the 42-year-old Flager makes what he says will be his final walk to the ring, his final time under the lights, and his final time to have his hand raised in victory. He has supreme confidence as all fighters must, but there's something different about the way he carries himself and the way he talks about this event. It's not the youth and bravado we hear from fighters all the time. Instead, he speaks in a measured confidence based on years of experience. Flager is a fun guy and you can tell, he's having a great time and he's physically and mentally prepared for his last fight. He wants to end his career on a high note, and he's put in the hard work, determined to make that happen. That being said, you can see it in his eyes. You can hear it in his voice. He's passionate about his team and the fighters he's training. He's a level-headed guy who understands his time is at an end, but can't wait to put on a great show. Basically, I was one hundred percent athlete when I was a kid. Say, fifth grade, and I started in gymnastics. In gymnastics, I met a boxing coach. I also started going to a boxing gym in North Carolina from five to fourteen, every summer. Did you ever compete in the Golden Gloves? No. No. It was just the gym work. I was interested, but my mom and dad never wanted to let me do it. I had to become a grown man (laughing) before I could really get into it. I got started late, man. I mean, I didn't have my first professional fight until 2009 or 2010. But you had 18 amateur fights? Yeah. I had 18 amateur fights starting in 2006. This will be your 18th pro fight. Yeah. I am 10-7 now, so I have had just as many pro fights. It's kind of crazy. What's, was the biggest difference you have seen between the amateur circuit and the professional ranks? It's just the time and the level. But there are a bunch of amateurs I fought in the pro's, guys that shouldn't be fighting pros. But there are guys out here that are on a completely different level you know. What makes you think you can beat father time? I see a little gray in those whiskers. I have already beat father time! (laughing). I am 42 man. He does catch up to me every night, but when I get up every morning, it's a new day. So I win. You know man, I started late. Before I started fighting, I was doing construction work with my brother-in-law. Once I started fighting, I decided I needed to put more of my focus on training. That's when I got a job in the gym, and I started personal training and stuff. Fighting kind of opened the door to me making a living in the fitness industry. Tell me about your toughest match? My toughest match was my last match. Fazlo Mulabitinovic, that boy was a monster. I was supposed to fight someone else, and he came in after my original opponent couldn't make weight. Wow. I am telling you, that kid was hitting me with kicks to the stomach and up top. His shots hurt. That was definitely my hardest fight. Even though I had let other people beat me, or I got submitted. It wasn't close. That kid was super tough. In fact, he hasn't lost in the two years since. Did that fight make you decide you needed to focus on coaching and be done fighting? I was ready before that. I didn't want to fight after 40. So, I was turning 41 in March. I wanted to stop fighting before I was 41. Are you one of these guys that hung up the gloves, but you are still around it, so it's hard to walk away? A lot was just, and the promoters are good guys. We have been talking. But, my kid AJ just lost. That bothered me. He got knocked out. He has everything, all the tools. I have one more fight on my Shamrock contract, and I feel like I have something to teach the kids that are fighting for me. There's a way to get yourself ready. Plus, I saw this guy, Scott Ettling and said sign me up! You know, Jesse Finney told me that you are such a busy guy because "all you do is ab work, 24x7". If I am not doing it, I am having someone else do it when I am coaching. I am "giving back" as I call it. Right now, I usually have fighters, but for the last two months, I had to tell them that I really couldn't train them because I need to put them on the back burner. I had to focus on what I needed to get done. This can be a very selfish sport you know because you have to focus on yourself. I have had them come up and train with me to help me get ready. What do you like more coaching or fighting? I love fighting, but I love coaching even more. Coaching is tougher. Coaching is a lot tougher for me. Fighting is easier for me because I just train and by the time I get in the ring, all the hard work is done. I definitely get more gratification seeing my kids succeed on what I can teach them. It's really great! You are spending a bunch of time coaching fighters now. 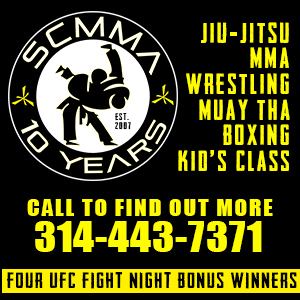 Do you have any special fighters you are working with that have helped you prepare for this fight? I do. Stanton O'Dell and AJ Graham. They are both money kids that will go places. Both of them. Ok. Let's get back to your fight on Friday. You are fighting Scott Ettling. I guess you have seen tapes of him? Yeah. This guy thinks he's going to walk through me. This dude shouldn't even be a pro fighter. This guy doesn't have the stand up to get in the ring with me. His hands. His grappling. Everyone talks about his grappling, but he hasn't fought the level of fighters I have fought. He likes to throw up submissions from his back. Well, I don't know that he likes to be on his back, but that's where he ends up. He's comfortable being on his back. He likes being on the ground. Look, I can go in there on my worst day and beat this kid. But it's a fight. Anything can happen. Your preference for this fight, do you win standing or on the ground? How does it end? Well, this fight will end up on the ground, with him on the ground. TKO. TKO. He can't stop it. Standing, I will murder him. He can't go to the ground with me. He will be lucky to get to the second round. If you could have one dream cage match, who would it be? Who would I take on? Out of anyone? I always wanted to fight Mike Brown or Uriah Faber. How would you have seen those fights come out? Man, I never got there. I don't know.